There is to be a public exhibition about proposed developments at the cinema site on Saturday 20 May between 1PM and 4PM. The development (by St George) already has planning permission and will comprise a Picturehouse cinema, homes, restaurants and shops. The exhibition will contain information about the delivery of the development and minor amendments to the existing planning permission. It will be held in the Ealing Broadway Centre, next to Vision Express. 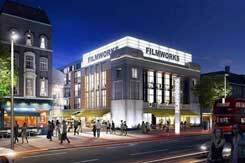 See Ealing Filmworks for more information.